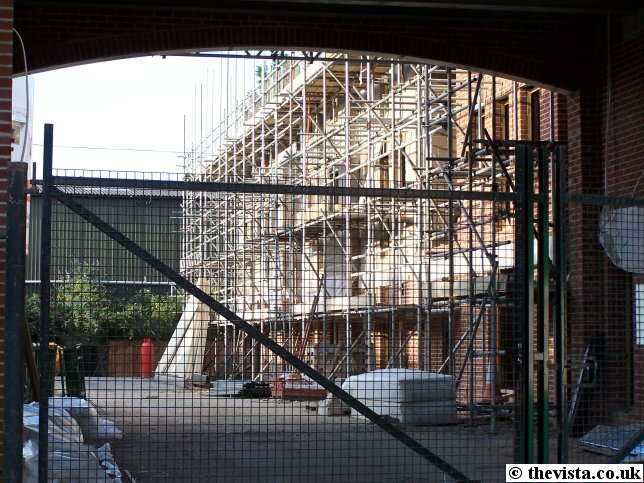 Station Street has had a large empty area on it for many years since the main brewery building was knocked down. 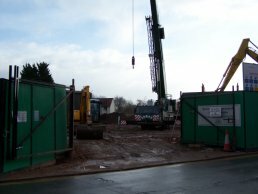 This was then used by Gwalia Van Hire as a place to store their cars, vans and lorries until it was sold as development land. Last year, sometime before September, McCarthy and Stone erected a fence around the site and work started on clearing the site. 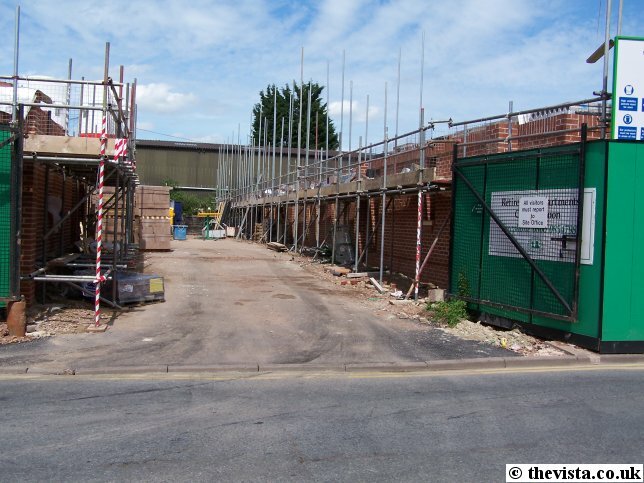 This site is going to be developed into yet more retirement homes. 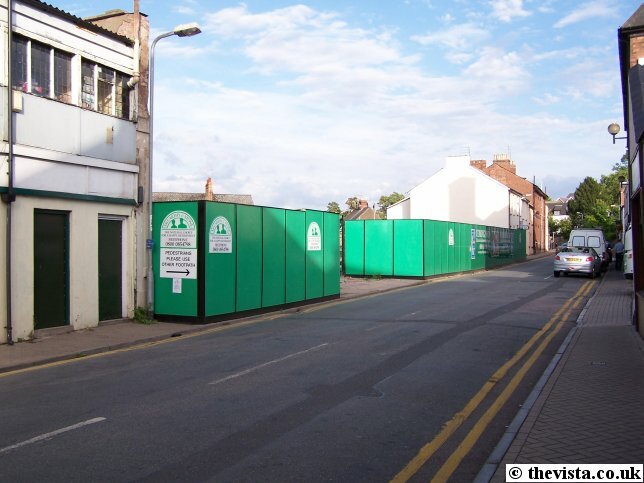 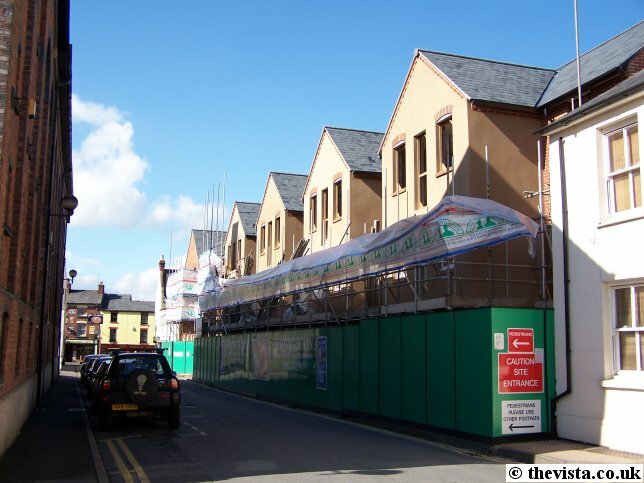 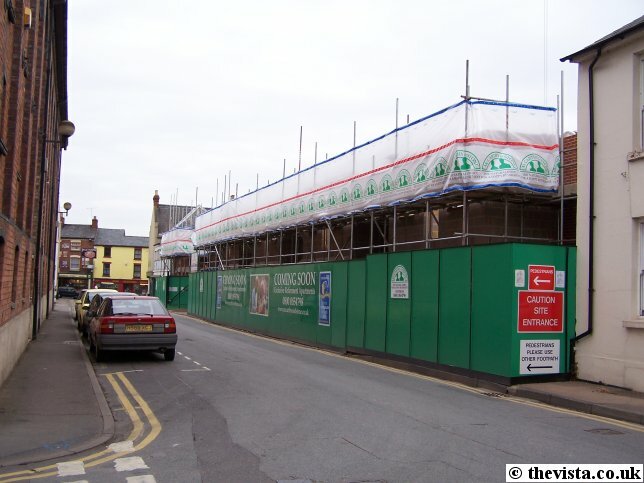 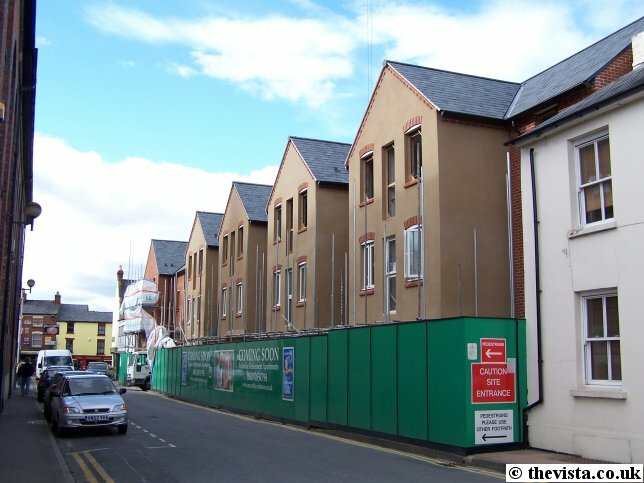 Currently (2-4-06) , and as one local shopkeeper stated, Ross looks more like a building site than a tourist attraction. 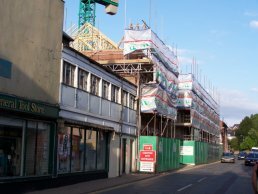 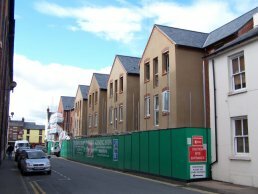 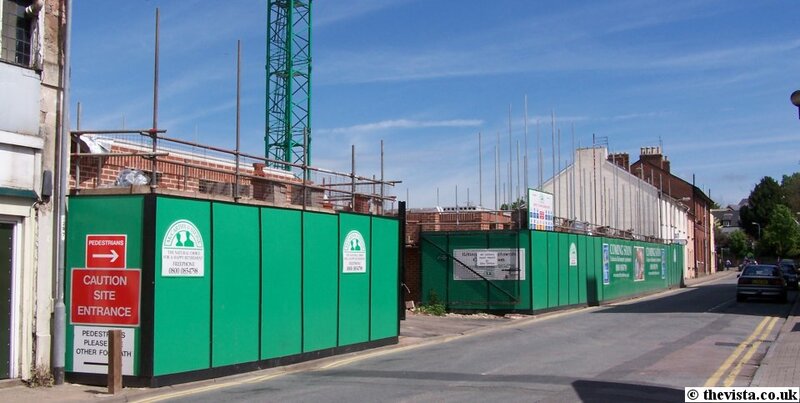 Currently there is building work on Ledbury Road (the site of the laundry), Brampton Street (the site of the factories half way up the hill), High Street (Nags Head), Copse Cross Street (next to where Meaders used to be), Gloucester Road (Texaco development), the two old shops on Brookend Street, Bank House on Broad Street and houses on Henry Street to name a few. 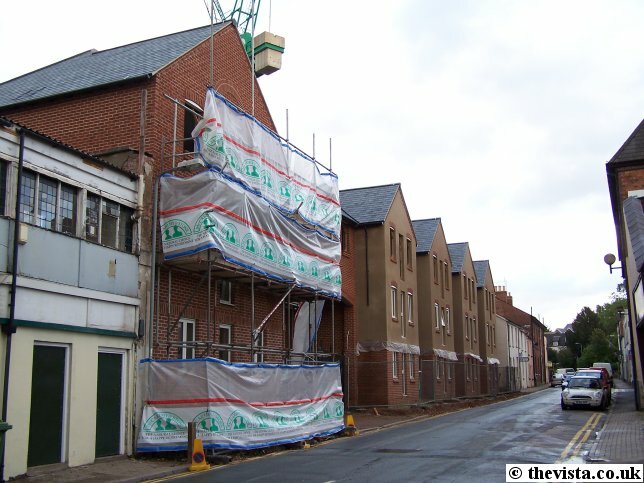 Some of these buildings and areas were looking 'rather rough' and the work will tidy them up. 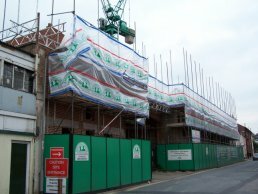 Hopefully some of these will be completed before too long. 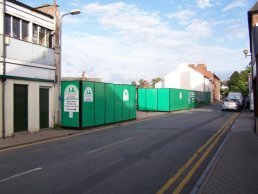 Here we see the site after the fence was added. 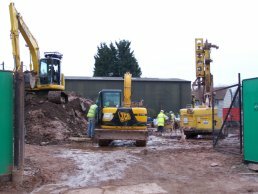 For the last couple of weeks, machines, like the one on the right of the shot, have been used to drill down into the ground all over the site. 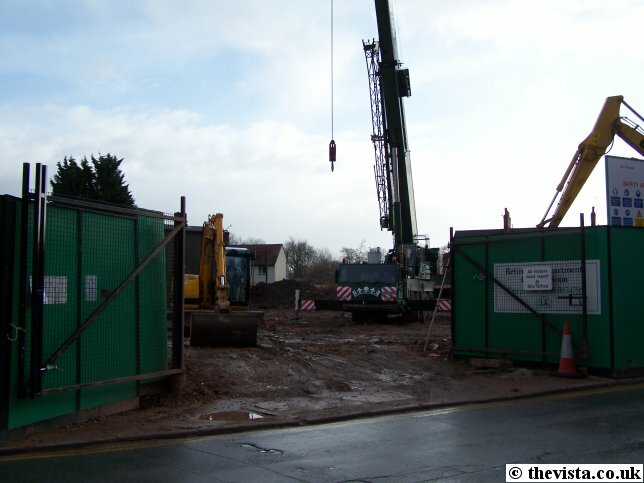 Presumably this is because the ground is very soft and piles are needed to support the buildings that will be put on to the site. 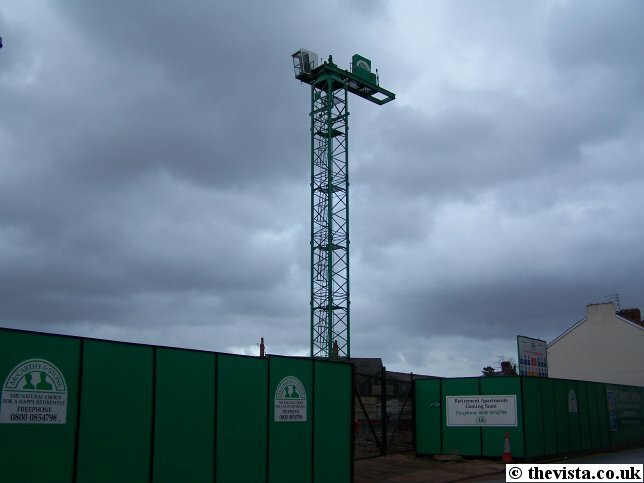 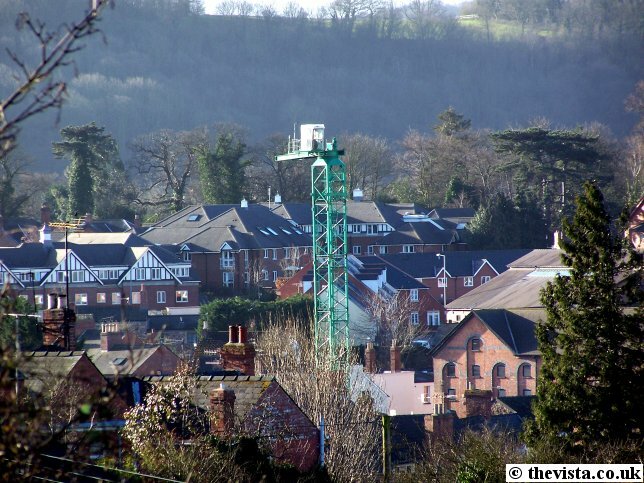 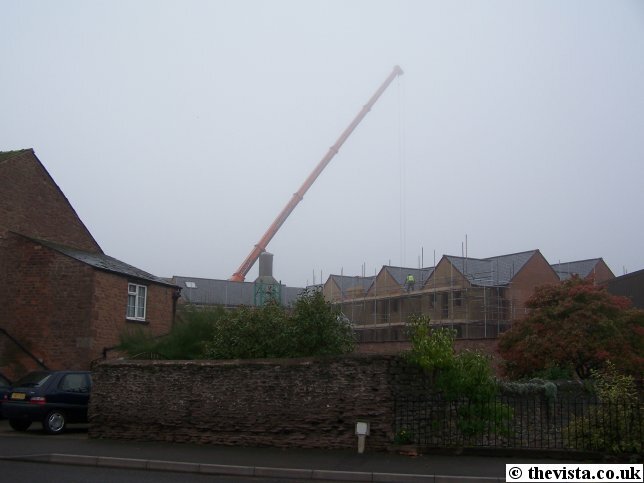 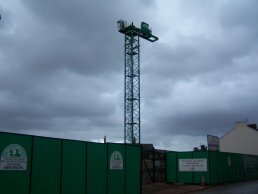 A crane has been erected on the site and towers over the town. 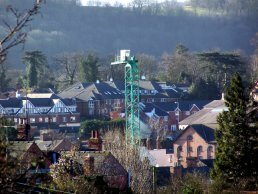 It can be clearly seen from the A40 when travelling from Monmouth to Ross. 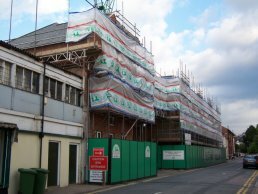 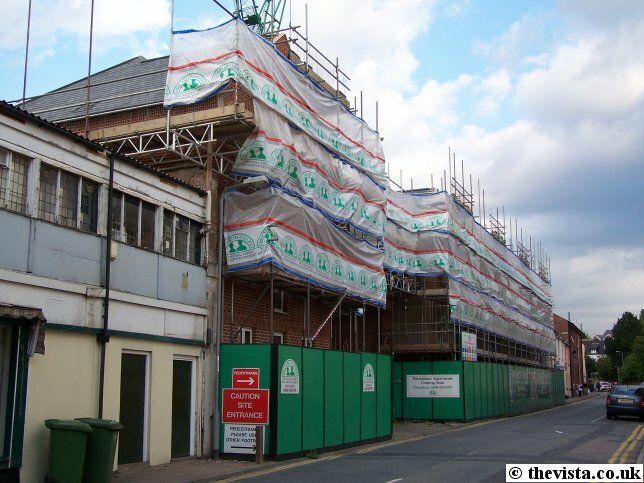 As we can see, the building is now well under way with the ground floor brickwork clearly visible. 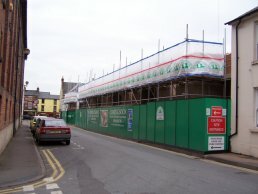 The second floor is now well underway. 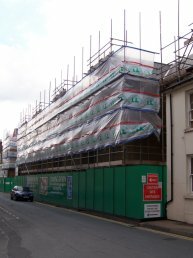 The third floor is now well under way. 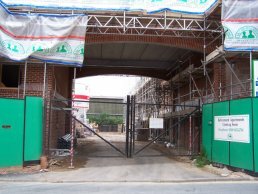 A large arch has been built over the entrance to the site. 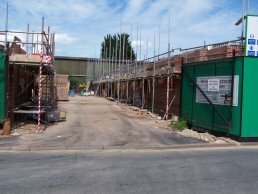 The third floor has now been built and the roof trusses have been fitted ready for the roof to be added. 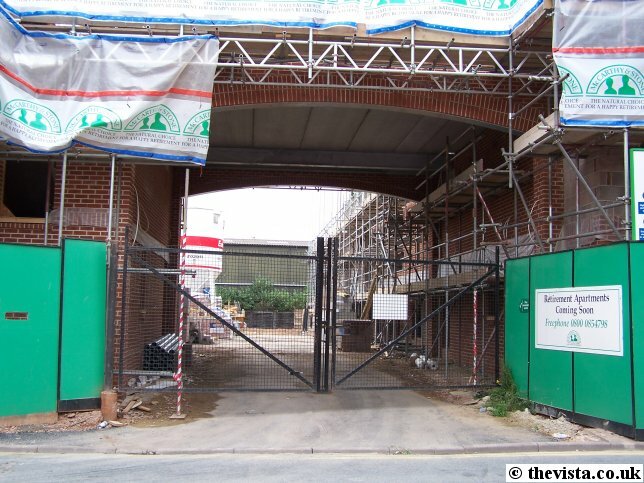 A large arch has been built over the entrance to the site giving it a more impressive and slightly menacing look. 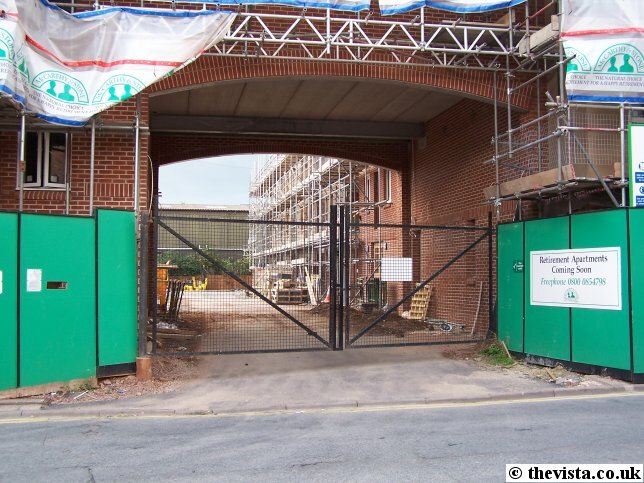 It looks slightly like a prison block at the moment with the gates closed. 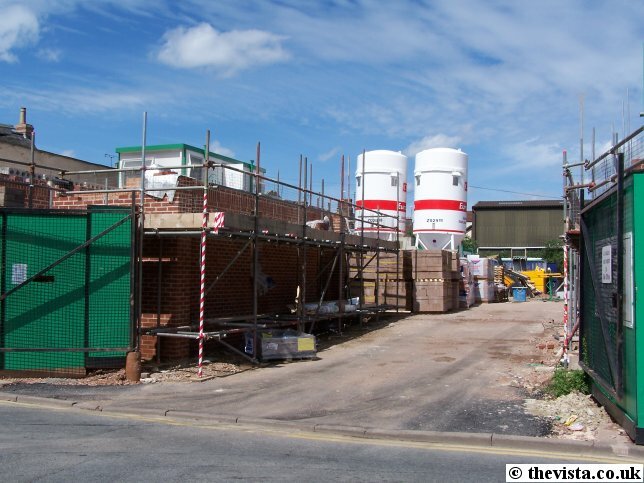 The roofs on the front of the building are new well under way or complete. 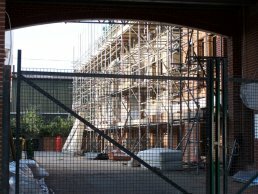 Work is continuing on the inner sections of the building as seen through the entrance arch. 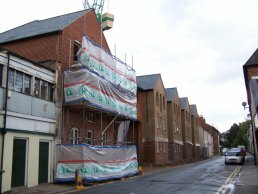 Here we see that the roof is now complete and the scaffold has been partially taken down from the front of the building. 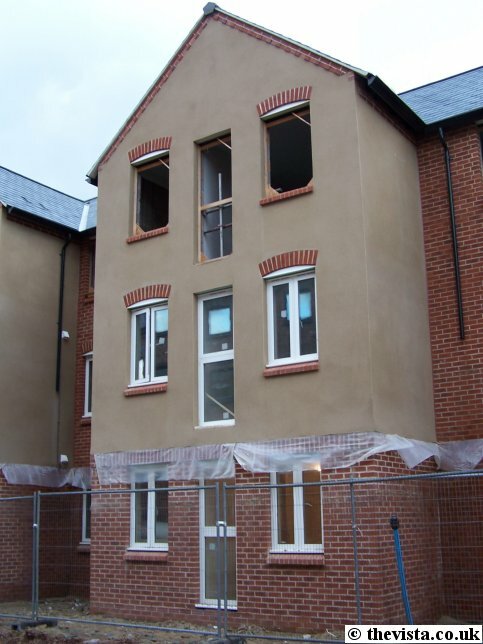 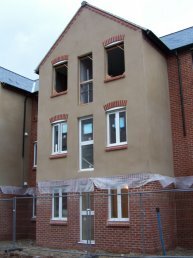 The front has been rendered and it looks like the windows and doors will soon be fitted. 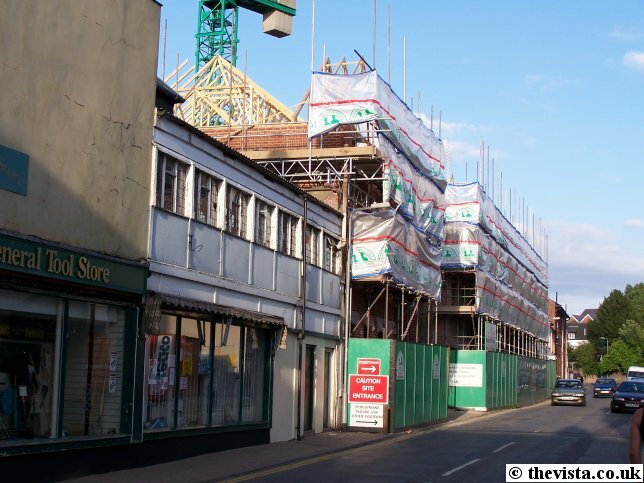 Most of the scaffold from the front has now been removed. 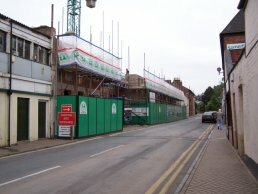 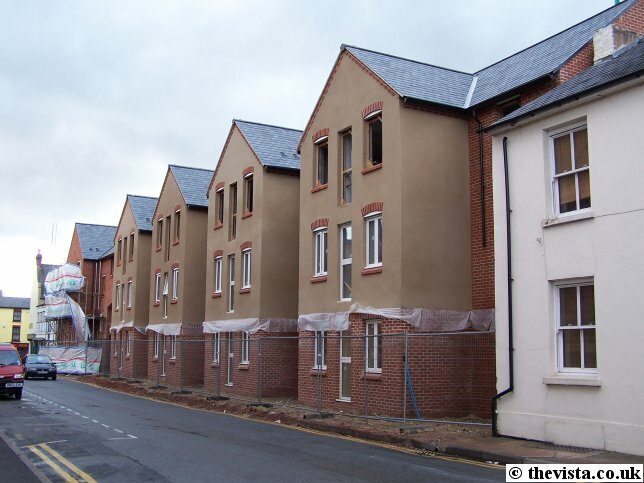 The green barriers and the scaffold have been removed from the front revealing the full frontage of the new buildings. 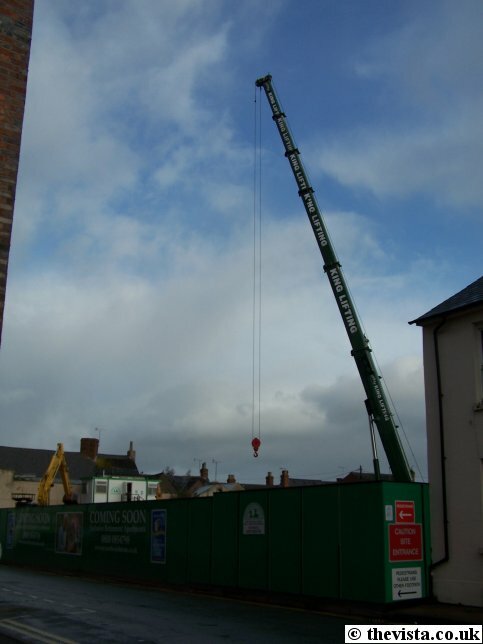 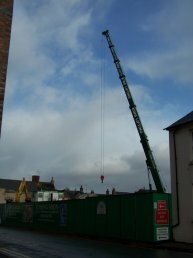 Today Station Street was blocked for the entire day as the green crane was disassembled and loaded onto lorries. 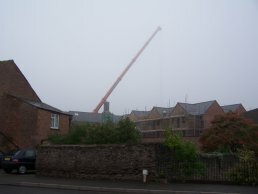 The crane is still being dismantled on the first really foggy day this autumn. 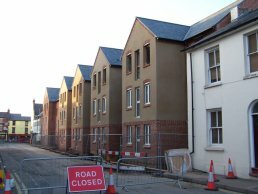 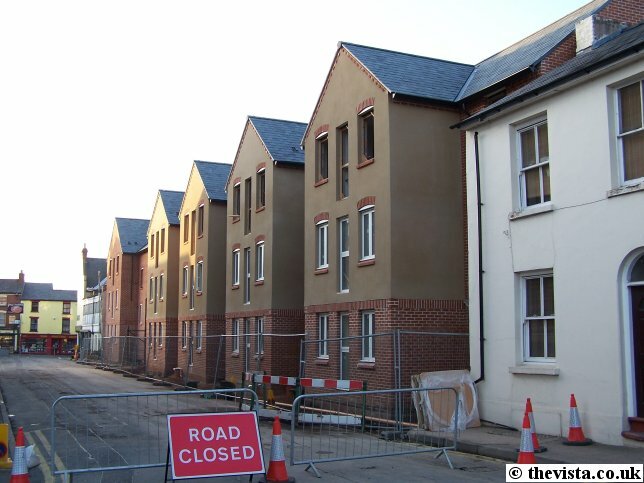 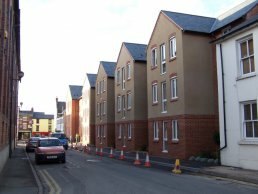 Station Street is still blocked off as the drains are being fitted along the front of the development. 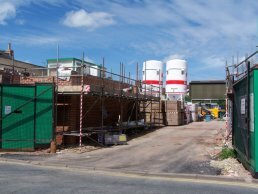 The frontage of the building is now being completed with a new pavement and plants are being added. 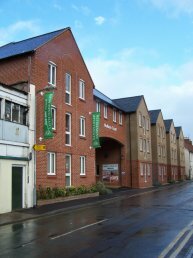 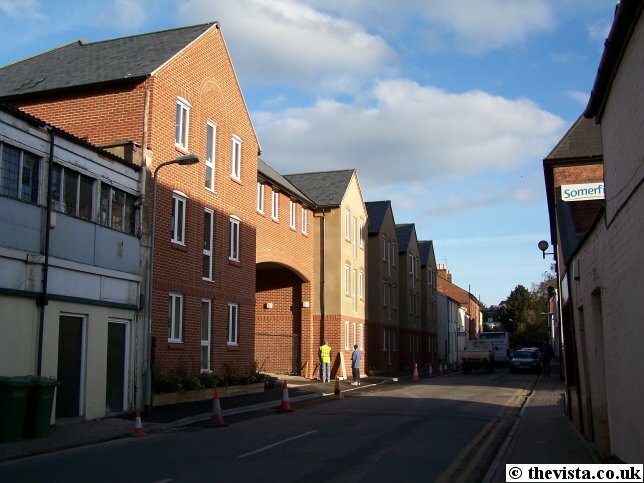 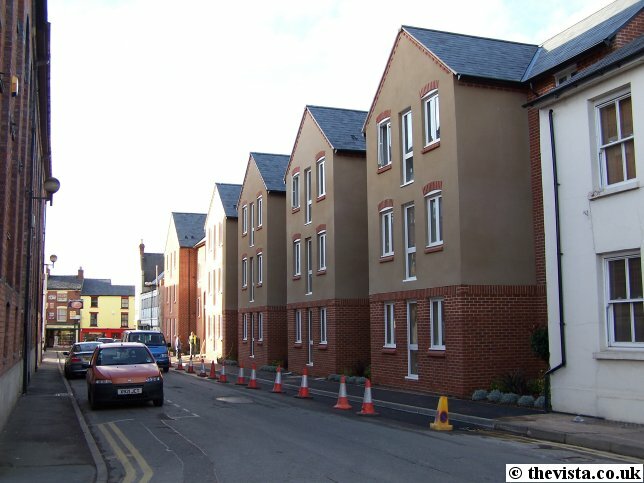 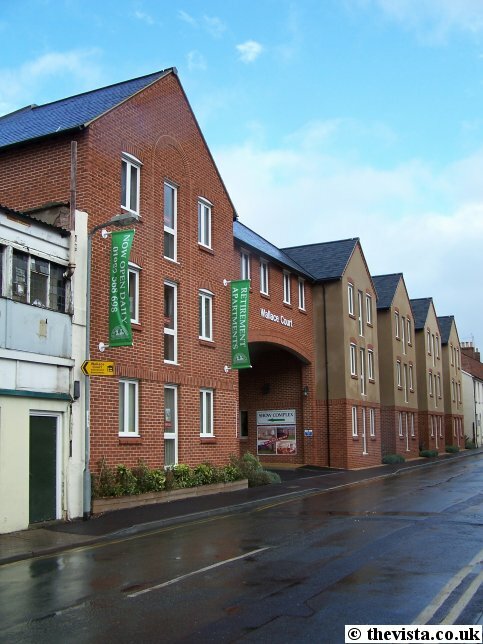 The name "Wallace Court" has been added over the entrance to the complex, people have moved into the flats and Station Street has been tidied up.